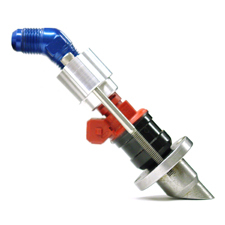 Designed to hold and feed fuel for one additional injector mounted outside the main fuel rail. * (1 unit) Lower Weld boss with angle cut (Specify Aluminum or Steel) and one top mounting hat, together with your injector, serves as an additional source of fuel supply to the engine. * (2 units) Stainless assembly retaining bolts. * Top hat is tapped for 1/4" NPT (Enables installation for AN type fuel fitting adapter as pictured in the above description. NOTE: DOES NOT INCLUDE AN fitting adapter). * Compatible with 14mm sized o-ring injector. * PLEASE NOTE REGARDING FITMENT: The 16.2mm internal bore on the lower weld boss will fit most injector types. If you have an odd type injector with a larger diameter lower body on your injector, please contact us for additional fitment options.